Panini continues to confuse the crap out of me with their checklists. 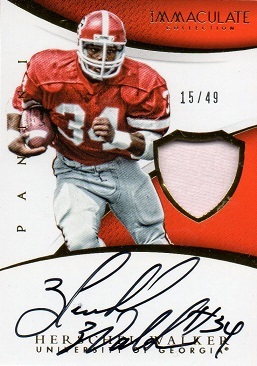 This latest addition to the hoard is an autographed swatch card of Herschel, from a 2018 Panini Immaculate pack. 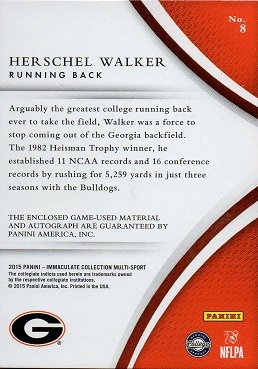 However, the date on the reverse is 2015, and the card # is 8, which is not Walker in any of the online checklists I've seen. It is serial #'d 15 of 49, which I guess makes it one of the Collegiate Collection update cards. I'm honestly not sure. It is a nice looking card, though, and I'm glad to welcome it to the Hoard.